Ice and Sky is my wife’s favourite game (and she doesn’t like a lot of games) and it’s a really interesting thematic and mechanical game. So how does it play and how much do I like it? What is The Ice and Sky like? 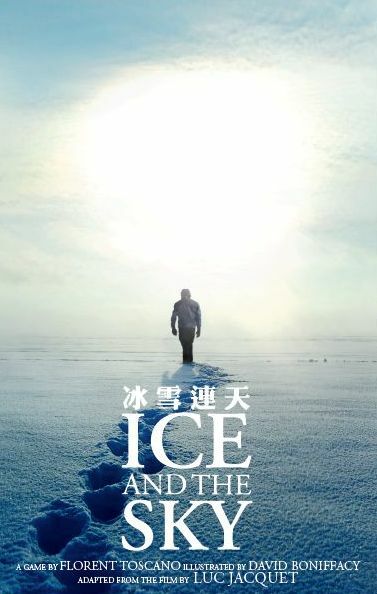 In Ice and Sky, you try to cooperate to balance the climate of the Earth while minimizing the human footprint. The game is inspired by a documentary by the same name, and while the game is very mechanical and abstracted, it somehow resonates the theme and the urgency to save the climate in a great way. Part of the reason is the way the game handles the in game objectives. When discussing the climate changes, it is rarely doubted that we have a huge impact. It is however often discussed how much the temperature can rise before we hit the point of no return. In the game this uncertainty is represented in that each player keeps a piece of the goal in their hand facing away so only the other players can see it. If feels like everyone is a scientist or country that each has a small piece of the climate puzzle, but only by working together can we solve it and do something about this impending crisis. The clues you have consists of two types of cards: Identification cards, and Biosphere cards. 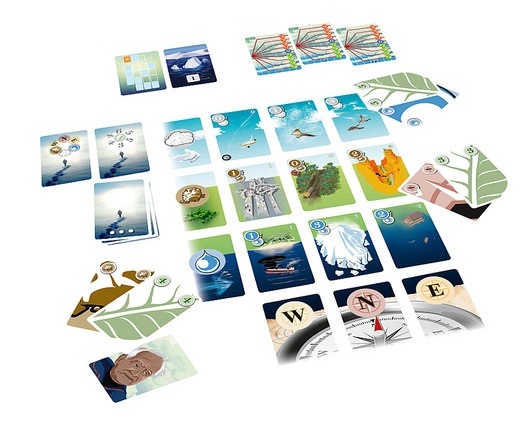 As you can see in the image above the game is played in a 3 by 3 grid and set up with an extra N,W,E row in the bottom and an Water, Earth, Air row of cards in the side. The identification cards you have in your hand corresponds to one of these extra cards. The Biosphere target cards is the target of the sum of the cards in that row. Reaching these goals is how you actually play the game. In your hand you also have so called generation cards (these are facing you and are not visible to the other players). These cards all have numbers on them as well as being of a particular element (Water, Earth or Sky). The players take turn playing and placing one card from their hand on a row that matches its element. If this action completes one of the objective sets the other players must say so. If playing a card destroys an already complete objective this must also be said. These are the only clues you get regarding the objectives. The game takes place over three rounds and at the end of the game you score how well you did by how efficient you were. There is more to the game but this is the main actions you take. It is in a nutshell a deductive cooperative game. I think this game does a lot of things right. It is definitely in the simpler end. It might be too simple for some, but I think they get a very beautiful and engaging game out of some simple systems. If you are looking for a light cooperative game with beautiful artwork and table presence you should without a doubt, give this a try. It handles the theme incredibly well and is a masterclass in how to integrate theme and mechanics (in simple games). The mechanism with cards facing away from you is also found in the game Hanabi. This is in a sense a more thematic version of Hanabi. Like Hanabi you will quite easily ‘beat’ the game. It is thus more about getting a good score than about beating the game. This is a family level game. I think anyone can play it and most people will get through it easily. Getting a good score though is a completely different story.